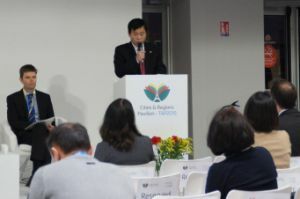 UNEP, ICLEI–Local Governments for Sustainability, and the Korean Environmental Institute for Technology and Innovation (KEITI) hosted a session on Saturday 5 December at the Cities and Regions Pavilion to raise awareness about the potential of sustainable public procurement (SPP) to reduce greenhouse gas (GHG) emissions. The discussion focused on how to measure the GHG emissions stemming from public procurement. Three members of the 10 year framework programme on sustainable public procurement (10YFP on SPP) presented case studies from Europe, Asia and North America that illustrate the role SPP can play in reducing emissions. The goal of the 10 YFP on SPP is to build the case for SPP on a global scale and support the implementation of SPP on the ground. The session saw UNEP, ICLEI, KEITI, and the Sustainable Purchasing Leadership Council (SPLC) showcase practical ways to reduce GHG emissions through SPP, as well as outline methods to effectively monitor impacts. Mark Hidson, Global Director of ICLEI’s Sustainable Procurement Centre, emphasised the importance of monitoring as a powerful communication tool for encouraging sustainable procurement. Farid Yaker, SPP Programme Officer, UNEP, announced a declaration drafted in November 2015 at a meeting on green procurement arranged by KEITI and UNEP in Seoul (South Korea). The declaration was endorsed by several partners of the 10YFP on SPP and Seoul meeting participants. The goals of the Declaration include highlighting sustainable public procurement as a public policy tool for achieving national climate commitments, and emphasising that if the actions of the public and private sectors on sustainable procurement are aligned, it will accelerate the achievement of ambitious climate goals. For more information, visit the 10YFP programme website.